Thank goodness, I woke up early this morning and dragged my self out of my bed, ate my breakfast and got our badminton rackets. My sister in law is my playing buddy almost every morning to give our bodies some energy to do all the works. We are just playing in front of our house (street) bec. it is seldom that vehicles pass by so we don;t need to pay for the court to play. We also need to exercise so that some of our toxins in the body will be washed away in our sweat and because we are not getting any younger anymore. Although we can't play every day religiously bec. of some reasons at least we can stay fit unlike those people who are so huge and who already need weight loss programs to keep themselves fit. Try this sport, half hour or an hour of palying is enough to get you going. Hi Jen I choose your blog as one of the top 7 that I post. I have tag for you.Pls visit my blog. hi Jen! 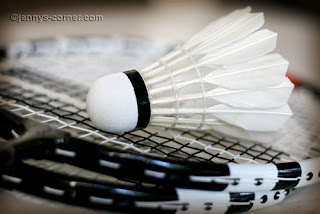 i love playing badminton too. i used to play it when I was still in the philippines. but i still have my old racket and stuff and would only get to play it once in awhile. i agree it's a good exercise!